Margaret Eby took a literary journey through the south. Though she now resides in Brooklyn, she grew up in Alabama. Her latest book, South Toward Home is an exploration of the places in the south that defined southern literature. 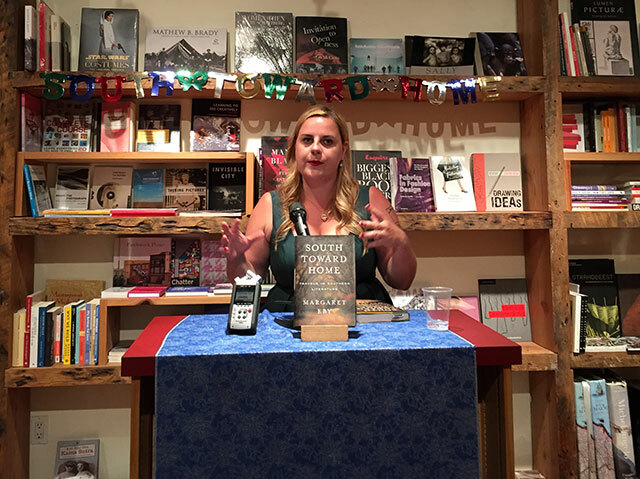 She read from the book at BookCourt and answered audience questions. The south is one of the few regions in the United States that earns its own cultural literary distinction — Southern Literature. Though Eby is quick to point out that there is such a thing as Western Literature from the western states, Southern Literature is unique in the way writers discus place. People in the south tell stories to describe a place. In South Toward Home, Eby visits various literary landmarks including the homes of authors, and talks with locals who have stories or who new the literary figures. She says that enthusiasts looking to replicate her trip need only turn to the web for information. Many of these historic homes have websites. They need visitors to help maintain them. The south offers a lot of literary opportunities. The book originally looked very different she says. Her editor made it manageable. She explains that in the final draft, each chapter says something about a place and really speaks to a specific geography. The south is not one thing, Eby says. The common thread between the authors is that they combatted the idea of the south with specificity in order to dispel misconceptions. One essay Eby was working on focused on Harper Lee. For many years, the town where her house was survived on To Kill a Mockingbird tourism. While she was working on the book, Harper Lee’s pseudo-novel Go Set a Watchman was announced and then published. Eby sees her essay as a kind of last look at the town before the publication of the book. “Part of the project is thinking about we keep,” she says, in terms of historical context. There are many ideas and concepts from the south that are important parts of southern culture. Some of those need to be left behind. For instance, Richard Wright had to literally leave the south in order to write. “Feeling southern as an identity is not something I felt at all growing up,” Eby says. Now, living in New York City, she says she feels much more like she has a culturally southern identity. She explains that while she doesn’t agree with the politics of the south, she can still tell people about Okra and which cornbread is authentic. Cornbread, apparently should not include sugar. The project is also about authorial identity. Readers have a certain idea about the writers they read. Writers all have a public persona. However, their friends and neighbors often see a very different personality. The “I” on the page is different than the actual person, and by talking to people who knew the authors, Eby discovered this other side of them. The project began as an essay she wrote for The Paris Review Daily. An editor read the essay and asked her for more. Suddenly she was taking a literary Pilgrimage. She also says that she was lucky that an English teacher put her class on a bus to visit William Faulkner’s house. Still, for her, this was always a personal project. “I never wanted to be Southern-splaining to people,” she says.